Depending on which report you look at, it would appear credit card debt is finally beginning to level off to some degree. While we’ve not abandoned our credit cards entirely, we’re also being a bit more conservative. Credit card debt is still considered most problematic for Americans, followed by mortgage debt. There’s a dark horse in the race these days too, specifically, student loan debt. These three sectors are causing sleepless nights for many as they struggle to find a way to meet their obligations. If you’re behind in your payments on any of your financial obligations, odds are, you’ve become quite familiar with debt collectors. These people will harass an account holder to the point of crossing both ethical and legal lines. They often tell debtors they have no rights and make threats that are illegal to make – much less carry out. Too many times, these consumers believe the collection agencies have powers to bring their threats full circle, when in fact, they are bound by legal compliance guidelines. He must tell you that he’s a debt collector for the company you owe money to. He must provide documentation – and it must be detailed – regarding the specifics of the debt he’s attempting to secure. He must also let you know your legal rights as a consumer, including a thirty day window to allow you to deem the debt valid or invalid. Not only that, but if you dispute the bill, he must provide documents to you that justify his efforts. He may not lie or threaten any consumer. If a collector can’t do any one of those things, he cannot pursue you – or at least, he can’t legally pursue you. This law, along with many others, are part of the Fair Debt Collection Practices Act. 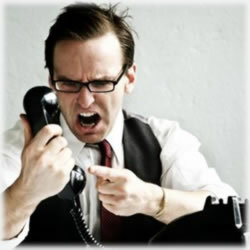 Debt collectors generate more complaints to the FTC than any other industry group. In its lawsuits alleging illegal debt collection practices, the FTC has been able to ban some debt collectors from the debt collection business forever, and has gotten millions of dollars back for consumers. The Federal Trade Commission, or FTC, is the country’s consumer protection agency. It collects complaints, investigates potential fraud, questionable business practices and others. When consumers file complaints the agency is able to identify “patterns of wrong doing”, which then leads to investigations and ultimately, when found guilty, prosecution of those operating under the radar. One of the worst things a debt collector can do is threaten to take your money out of your bank accounts or hijack your government benefits, retirement payments or unemployment compensation. Sadly, it happens all too often. Debt collectors can not put you in jail, they can’t call you after 9 p.m. or before 8 a.m. and they can’t contact you more than three times in a week. While they do have the right to contact friends, neighbors, employers or spouses, they can’t reveal the reason why they’re searching for you. There are laws that protect you and attorneys who specialize in these types of cases. If you feel as though you’re being threatened or if a debt collector is crossing the line, you might wish to discuss your options with a lawyer. By the way, the Federal Trade Commission tells us that if a consumer has an attorney representing her in financial matters, a debt collector must go through your legal representation instead of contacting you directly. Here’s an especially important fact that few consumers are aware of: even if the collection agency is following the law, it can still get out of hand, especially if they’re aggressively pushing the bar and halting right before crossing the line. You can put in writing to the collectors that they stop writing and/or calling you. Be sure to include in your letter the specifics of the account they’re pursuing you for. Fair warning – even though they must honor your demands, they still have legal options, too. They can sue you for the monies owed. There are many consumers who do mange to work out a reasonable payment plan and more often, the debt collectors and consumers agree on settlement. This is a negotiated balance that allows the consumer to settle, in full, for a fraction of what the bill is and it also allows the collection agency to at least recover some of the funds. That said, the IRS put into place specifics for how these agreements must be included in a tax return. Known as a 1099-C “cancellation of debt” tax notice, the IRS requires forgiven or canceled debt be counted as income. Creditors and debt collectors who agree to accept at least $600 less than the original balance are required by law to file 1099-C forms with the IRS. This triggers a notice that is sent to the debtor with the requirement that the taxpayer/ consumer include it in their returns. Many folks are caught off guard when they receive these notices. After all, they settled with the agency because they didn’t have the funds to pay the balance in full. So now, in some ways, it’s as though the taxpayer is paying taxes on money he never had. But it is legal and it is being enforced by the IRS. A person with $10,000 in credit card debt who negotiates to pay only $6,000 of the balance would have $4,000 in forgiven debt income. That $4,000 must be reported as “other income” on Line 21 of the 1040 tax form. Depending on the amount of debt forgiven, the taxpayer’s income level, deductions and other factors, the consumer could face a sizable tax bill come mid-April. Have questions? There are many resources, including government sites, that can provide in depth and more personalized answers and/or solutions so that you can negotiate the best terms for your needs. Bottom line is your current financial position should never dictate the way others treat you – especially collection agencies.